Buy an iPad 1st generation complete front glass, digitizer and frame assembly for the 3G WiFi model only. This is a brand new high quality iPad 1 digitiser and frame assembly. 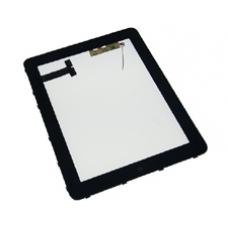 If you have broken the glass screen on your iPad this spare part makes the repair very simple and straight forward, we supply you with a fully assembled front screen for the iPad this includes the glass digitiser and touch screen already mounted on the plastic frame with a new home button installed and the metal retaining clips. All you need to do is install you LCD screen and light sensor into this screen assembly, connect it all up and you have a repaired iPad. * Compatible with only the iPad 1st Generation 3G WiFi Models. * Includes Touchscreen Glass Digitizer, Home Button, the Frame and Clips for iPad 1st Generation 3G WiFi.